This top is perfect for any time of year, whether it’s worn like a vest when it’s warm or layered up with a shirt on cooler days. This design is a great knit-night project, as it’s mostly stocking stitch with just a touch of pretty lace on the front. 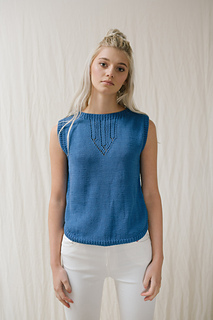 Sleeveless summer top in DK weight cotton. Short row shaping to create curved hem.